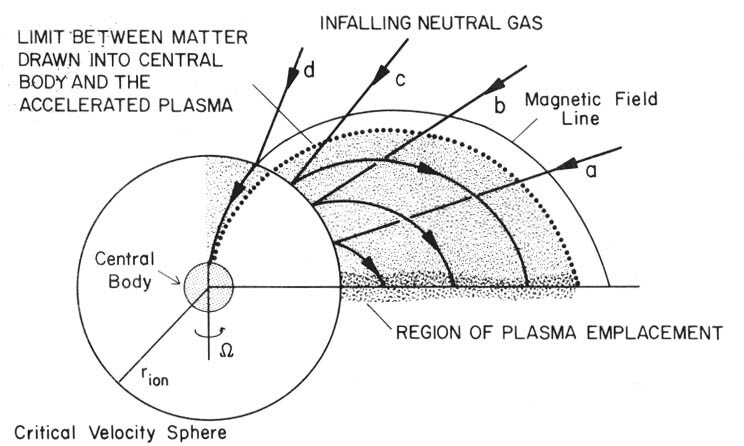 FIGURE 23.2.1.- Complete ionization of infalling gas. Gas falling in from infinity reaches the critical velocity at rion (the critical velocity sphere) and becomes partially ionized. It is rapidly included in "superprominences" which, if , are almost completely ionized. Matter falling in at low latitudes (a, b, and c) will be emplaced near the equatorial plane and condense there. Matter arriving at the critical velocity sphere at high latitudes (d) will be drawn into the central body. Note that the processes a, b, and c do not necessarily interfere because they may occur at different times or even simultaneously at different longitudes.